Thirty minutes drive from downtown Shanghai is a suburb which would never grace the glossy brochures promoting China’s commercial capital, even if the price of apartments would suggest otherwise. In the Putuo district, known mainly for its bland tower blocks, a three bedroom off-the-plan apartment of just 98 square metres is on the market for 9.1 million yuan. That’s $1.74 million in a city where the average wage is still only $1215 a month. Even when taking into account that China’s wages data often underestimates the real earnings of many workers, it shows why, for Chinese buyers, Australia looks cheap. Credit Suisse quantified this in a research note last week showing medium apartment prices in Beijing, Shanghai and Shenzhen were all at least 15 per cent higher than those in Sydney and 50 per cent higher than Melbourne. At the same time, the rental yields in Sydney and Melbourne were double that of China’s three most expensive cities. While the Credit Suisse research was instructive it didn’t illustrate just how big the quality gap was between Sydney and Shanghai. While $1.74 million buys you a non-descript apartment in suburban Shanghai, in Sydney for not much more money you can be downtown with water views. Lend Lease is currently selling two bedroom off-the-plan apartments of 84 square metres in its Darling One development for $1.85 million. That’s slighter more expensive than the Shanghai example for a smaller apartment, but its view across Darling Harbour is more appealing than the pancake flat surrounds of Shanghai’s urban sprawl. And that’s before you consider air quality, drinkable water and proximity to parks and beaches. “On measures of price and affordability Shanghai tends to be more expensive than Sydney partly because Chinese people don’t have as many investment alternatives as Australians,” says Michael Cole, the founder of Mingtiandi, a provider of information on the Chinese property market. According to Cole the absence of a major downturn over the past two decades has also given buyers the confidence to pay ever larger sums for property. When moving in from Shanghai’s suburbs to the downtown this confidence starts to border on the absurd. 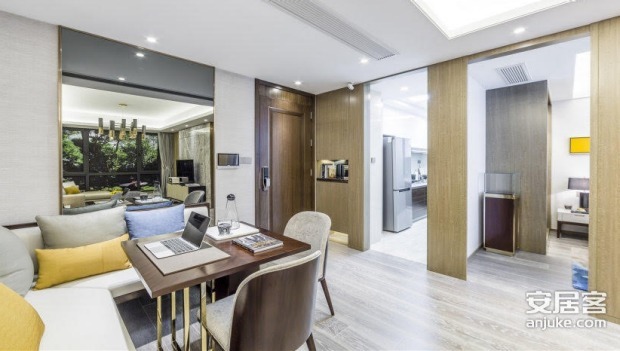 In the fashionable Jing An district, named for the city’s most famous Buddhist Temple, a 233 square apartment will set you back 35 million yuan ($6.7 million). For this you get a well appointed apartment, but no view over Shanghai’s historic Bund or Huangpu River. Rather the outlook is over the tartan running track of a local middle school, an elevated road and then into the low rise houses of the former French Concession. For the same money in Sydney you could afford an apartment on Wolseley Rd in Point Piper, with direct views of the harbour bridge and Opera House and the bragging rights of sharing a postcode with the Prime Minister. And to provide more ammunition for those who believe parts of the mainland property market are precariously over-valued it should be remembered that Shanghai is only China’s second most expensive city. The medium apartment price in Beijing is above $900,000, according to Credit Suisse, compared to Shanghai at $850,000, followed by the technology and manufacturing hub on Shenzhen at $820,000. But while Shanghai and Beijing have seen the price of new apartments rise 75 per cent since January 2015, the Shenzhen market has shown growth of 175 per cent over the same period.